I’ve finally found a way I like to consume chardonnay! It’s no major secret that I love wine, and there are certainly ones I love more than others. But for some reason I can NOT find a chardonnay that I like. I’ve tried a bunch, and I just don’t like them. I call them chardon-NO. My mom’s not the biggest fan either, and she’d tried a bottle I had in my fridge but didn’t like it, then had the brilliant idea to use it as a marinade instead. 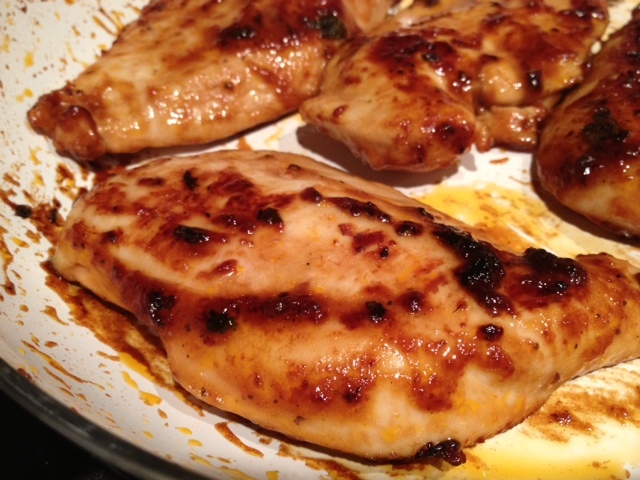 We threw this recipe together a couple days after my surgery, so simple was the key word. It was actually meant to be grilled, but all the recent rain had tripped some kind of ground wire and my outdoor outlet didn’t work, so we cooked it on the stove instead. Always have a backup plan. What was surprising was how unique the flavors were! I mean, barbecue is always good, and Sweet Baby Ray’s is the best. 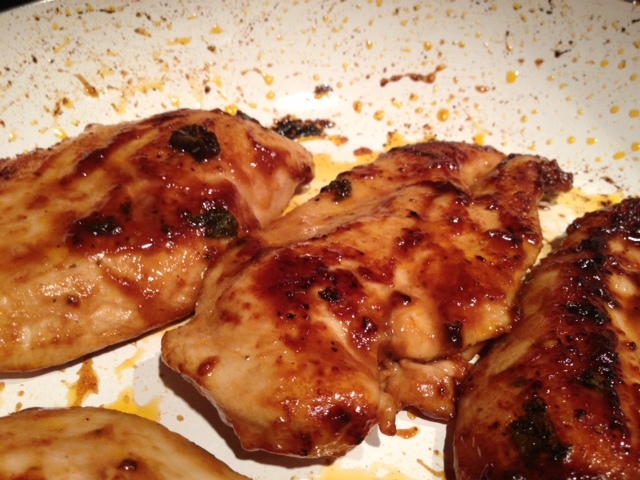 But you could really taste the chardonnay in there, and it added a really special flavor to the barbecue sauce—sweet without being cloying, and with that oaky depth (almost a little bite) that I don’t like in wine but somehow I really loved in chicken. Plus the sage fried up into little awesome crispy bits. I’m salivating just looking at this. And it’s 8:30 in the morning. 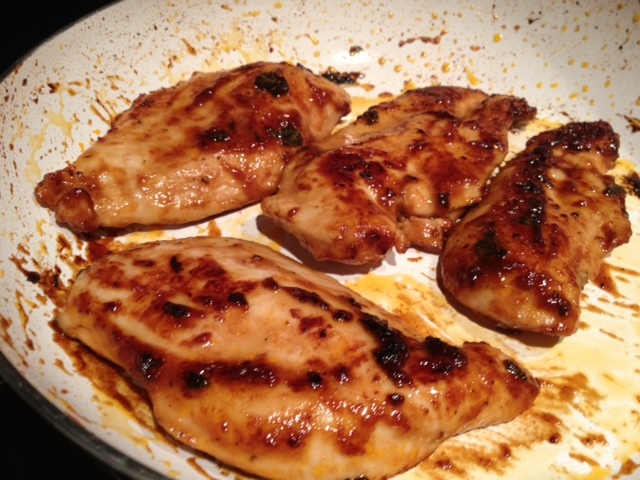 It just sauteed up so well—so moist, with the marinade forming a glaze. This will definitely become one of my go-to marinades, and I also think it would be totally awesome on salmon as well. You could cook a whole big batch of chicken up with this marinade and then use it for sandwiches, salads, or just to gnaw on cold right out of the fridge. 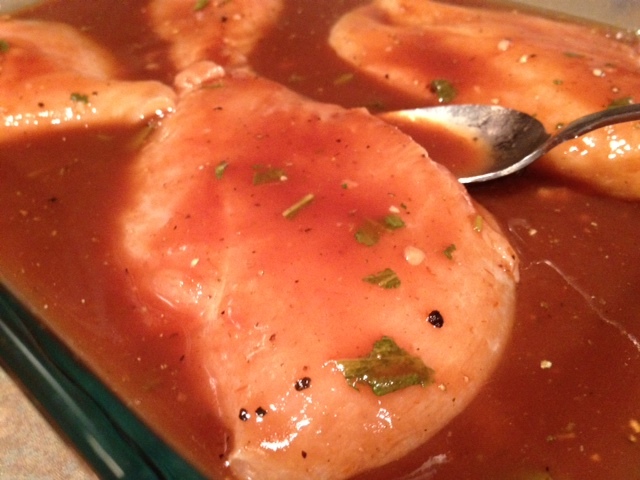 Throw the chicken breasts and all the marinade ingredients into a big ziploc bag, pan, or tupperware container. Marinate for at least a half, but can be longer if you need. If grilling, grill like you normally would. We sauteed them in a pan with the tiniest bit of olive oil until they were done. Or you could bake at 400 F until cooked all the way through.